Member of the tribe Jerry Seinfeld is visiting Israel again. After his flight was delayed for four hours he landed at 7:30 am Friday, for a three day trip along with DreamWorks CEO Jeffrey Katzenberg. Over 35 years since first coming to Israel to work as a volunteer at Kibbutz Sa'ar, Seinfeld's current visit is aimed at promoting his animated film "Bee Movie," for which supplied the voice of the main character, in addition to serving as a producer. The plot takes a humorous look at the life of Barry B. Benson, an opinionated Bee who sues the human race for stealing honey. Apart from a press conference and a meeting with Olmert scheduled for Sunday, the American comedian was invited for lunch with President Peres, in which the media was not allowed to participate. 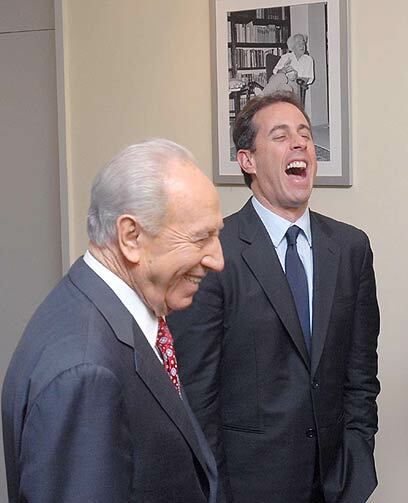 In his meeting with Peres (who has seen quite a few episodes, it turns out), Seinfeld received a survey of recent developments in Israel, and was invited by the president to celebrate the Jewish state's approaching 60th birthday. Seinfeld said he would be honored. We'll see about that. See all talkbacks "Jerry Seinfeld in the Holy Land"